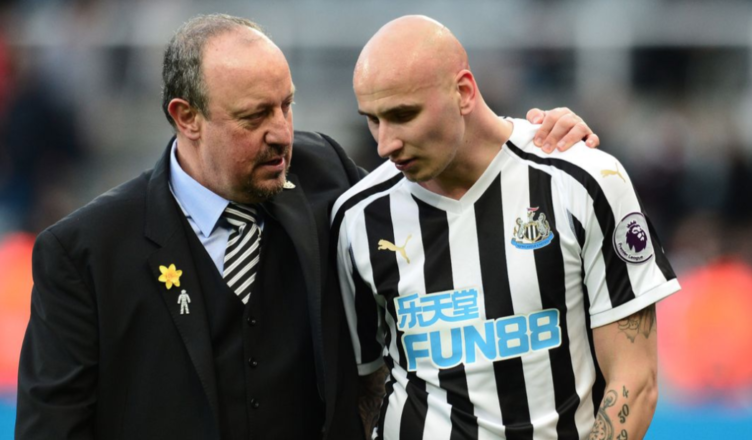 Jonjo Shelvey drops huge hint when asked about his future at Newcastle United – NUFC blog – Newcastle United blog – NUFC Fixtures, News and Forum. Jonjo Shelvey says anyone claiming he’s now ‘finished’ at Newcastle will have to ‘eat their words’ – insisting that his sole focus is to get back into Benitez’s first team. Longstaff’s emergence has made many question whether he has a future at the club – with claims of a £20m move to West Ham also emerging – however Shelvey’s post match comments sound nothing like that of a player who wants out. “There’s been people saying my career is finished and I’ve got no future at the club. He sounds in a defiant mood and ready to prove any of his doubters wrong. His 15-minute cameo in our dramatic win over Everton was just his second senior appearance of 2019, with him requesting to play for the U-23’s recently in a bid to regain some match fitness and impress Rafa. “I only played 15 minutes there, but it’s a start. I am happy to be back in the squad, I’ve had to wait my chance, my turn. I’ve been training on a Saturday and then coming over to watch the game – it’s horrible you just end up eating loads of food in the box but I’m just glad to be back out there and back helping my team. “My aim is to get back into the starting 11 but can only do that be getting the appearances in and showing the manager what I can do and showing the club club what I can and offer. He splits opinion, but there’s no doubt in my mind that an on-song and motivated Jonjo Shelvey is one of our biggest assets. Let’s hope he can stay fit, get back to his best and form what could be a formidable partnership with Sean Longstaff. Exactly, when he’s on song, and that’s pretty seldom. As I’ve said, and the caveat as always is whether Rafa will be given the money back to spend, I’m certain Rafa could find someone better, more consistent, less likely to keep missing Hollywood passes, and a lot less likely to lose the head, with the 20+ million we’d get for him.